You know, this whole 'deep cover' thing... It just wasn't -- it wasn't terribly well thought out. Donning this -- this Cas mask? This grim face of angelic constipation? Just ugh! 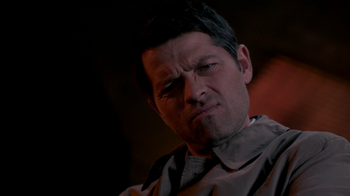 Casifer is a portmanteau of Castiel and Lucifer. It arose in fandom after 11.10 The Devil in the Details in which Castiel consents to possession by Lucifer. Some fans also used the variant Lustiel, which was endorsed by Misha Collins. Writer Robbie Thompson confirmed that, following the canonical convention of shortening Castiel to Cass, the writers used the name "Cassifer." However, fans continue to embrace their own preferred spelling. Castiel says "yes" to Lucifer. While battling him in Hell alongside Sam and Dean, Castiel secretly consents to possession by Lucifer, under the agreement that Lucifer will defeat the Darkness. Lucifer then pretends to be Castiel around Sam and Dean before revealing himself to Rowena and Crowley. After confirming with Rowena that she is the only one who can open the cage, he snaps her neck and imprisons Crowley. An angel named Nithael discovers Lucifer (using Castiel as a vessel) in a park and attacks him. Lucifer assures the angel that he is going to, "save you all. Lucifer ex machina," before killing Nithael: exploding him with a snap of his fingers. Later, Lucifer ransacks the bunker in search of a way to defeat the Darkness and is confronted by Dean, who confides that he's tried to stop the Darkness twice but couldn't do it due to an inexplicable attraction to her. Still pretending to be Castiel, Lucifer reassures Dean that they may be able to use that attraction to their advantage as a means of drawing her out. "This could be a good thing," he says, and promises that the next time Dean faces the Darkness, he won't be alone. In Hell, Lucifer is reigning as a king disinterested in souls or the demons that serve him and displaying interest only in a game on his iPad and Amara. He confides in Crowley (who he keeps chained and calls "doggy") that he lied when he told Castiel he was able to defeat the Darkness alone. Meanwhile, Sam and Dean discover a Hand of God in the past that they believe could stop the Darkness. Lucifer, as Castiel, agrees to take Dean back to the past to retrieve it, but is blocked from accompanying him onto the submarine by Enochian warding against any supernatural and angelic interference. In the present, Sam and Casifer attempt to find another way to retrieve Dean. Lucifer plays along before eventually revealing himself to Sam before threatening to kill him, saying that he'll explain to Dean that Sam begged him to do it, to use the power of his soul to "blast through the warding" and rescue Dean in the past. However, before Lucifer can kill Sam, Castiel regains control of his vessel to restrain him. Sam begs him to eject Lucifer, but Castiel explains, "We need him to save Dean." Casifer returns to the past to retrieve Dean and the Hand of God, and when they return, Sam reveals that "Castiel" is actually Lucifer. 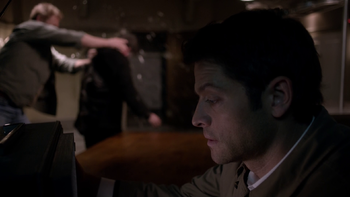 After a monologue and a brief fight in which Lucifer attempts and fails to use the already exhausted Hand of God, Sam draws an angel banishing sigil, which casts Casifer out of the bunker. Back in Hell, Lucifer (still in Castiel's vessel) has put the demons to work looking for another Hand of God. A demon named Simmons who was loyal to Lucifer seems to be playing both sides as she helps Crowley to escape. In actuality, she remains loyal to Lucifer, and they use Crowley to lead them to a hidden warehouse of stored weapons. Lucifer attempts to steal the Rod of Aaron from Crowley, but Crowley has already hidden it on his person. He uses its power to attack Casifer, but Simmons takes the majority blow and is killed in his stead. Before Lucifer is able to return the attack, Crowley vanishes. An ambivalent Castiel watches TV in his mind while Lucifer assaults Crowley. Lustiel returns to Heaven to tell the Angels about a plan to stop the Darkness permanently in exchange for leniency and the ability to return to Heaven whenever he pleases. After Amara is healed by a revived Rowena in the aftermath of the Angel Smiting, she delivers a cosmic shockwave that temporarily shrouds Heaven in darkness while Lucifer looks on in recognition and amusement. He tells them that the attack is a minor example of her true power and restates his usefulness in taming her. Lucifer is later summoned by Sam and Dean with the help of Crowley and Rowena and imprisoned in an Archangel Trap encircled in a ring of holy fire. He notices that they have the Horn of Joshua and he offers to use it against Amara, but they use a suppression sigil to try to communicate to Cas. This is ineffective since the sigil fails to properly allow direct access and Lucifer is able to retake control. Crowley tries to get Cas to fight back by possessing his vessel, but is almost killed by Lucifer in the process. Sam and Dean are able to exorcise Crowley out of Castiel's vessel, but they realize that the holy fire has been extinguished. Lucifer retrieves the Horn of Joshua and attempts to kill Sam and Dean, but Amara, who had been tracking Rowena, intrudes. Lucifer absorbs the energy resonating within the Horn of Joshua and aims it at Amara, but Amara is undeterred by the blast and she transports herself and Lucifer away. After beating him and refusing his offer to work with him, Amara tells Lucifer that he might be the one thing that will draw God out of hiding so she could confront him and destroy all of creation along with him. 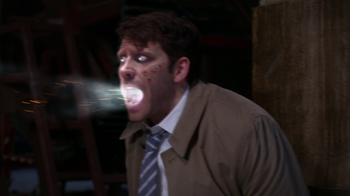 Lucifer tries to tell her that God won't come because of his departure, but Amara believes otherwise and begins to torture Lucifer from inside Castiel's vessel while his screams echo. Lucifer, still in Castiel, continues to be tortured by Amara who contacts Dean mentally and tells him that both Lucifer and Castiel are not doing well and to let God know. With the help of Donatello Redfield and Metatron, the Winchesters rescue Lucifer, who agrees to put aside his differences with God to fight Amara. Upon returning to the Bunker, God and Lucifer meet again for the first time in millennia and God heals the damage done to Lucifer and Castiel by Amara. Lucifer is ripped out of Castiel by Amara. Under pressure from the Winchesters, Lucifer and God reconcile and begin working with the Winchesters to defeat Amara. As part of this, Lucifer returns to Heaven to ask the angels to perform another mass-smiting. When they refuse to listen to him, Lucifer relinquishes control to Castiel, whom he refers to as his better half or "Jiminy Cricket." Though the angels are reluctant to listen to Castiel due to his allowing Lucifer to possess him, Castiel tells them he believes his role in the battle to come is to give Lucifer form on Earth despite the fact that it's burning through both him and his vessel. 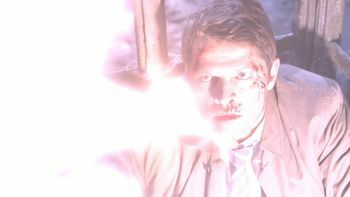 Castiel is able to convince the angels to help and restores control to Lucifer who strikes the final blow in the battle with Amara using Castiel's form. However, when God tries to transfer the Mark of Cain from Amara to Sam to trap her again, Amara attacks and mortally wounds God. When Lucifer tries to intervene, Amara yanks him from Castiel, leaving Castiel unconscious and forcing a weakened Lucifer to find another vessel. After Amara disappears, Dean checks on what he believes to be Lucifer only to find that he is just Castiel again. Castiel tells the Winchesters about Amara yanking Lucifer out of him, but doesn't know what happened to the archangel after that. Dean later tells Castiel he understands why Castiel agreed to be possessed by Lucifer and now feels it was the right choice since it was their best shot at Amara and no one else would have done what he did. This is possibly a reference to when Mark Pellegrino, who plays Lucifer, originally auditioned for the role of Castiel. This page was last edited on 21 June 2018, at 23:48.